A Short Flight Today Between Rain Showers - - PAGE 442. A Short Flight Today Between Rain Showers · · PAGE 442. July 28, 2018: I managed to get in a short flight and discovered rain showers to the North and South limited my flight today. 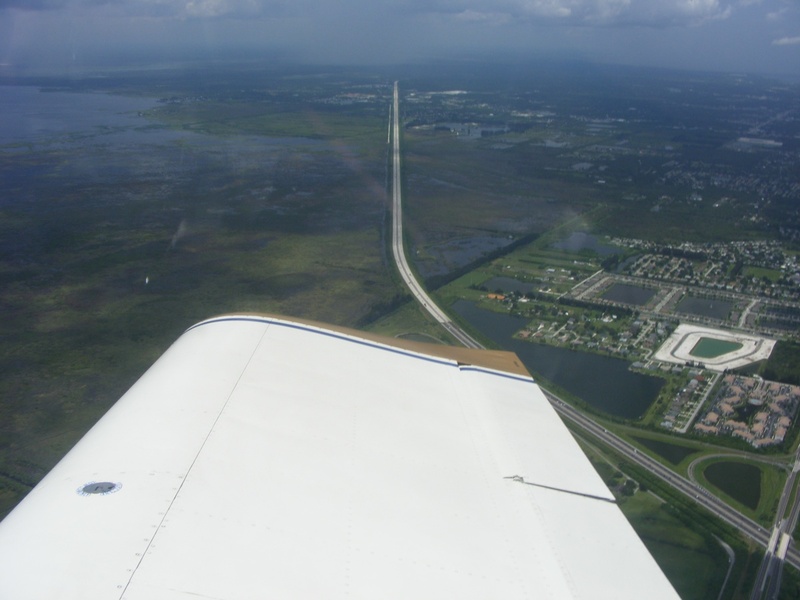 That is I-95 looking north as I am turning around and climbing up to 2,000 feet MSL. This is the first of two turns during my climb. 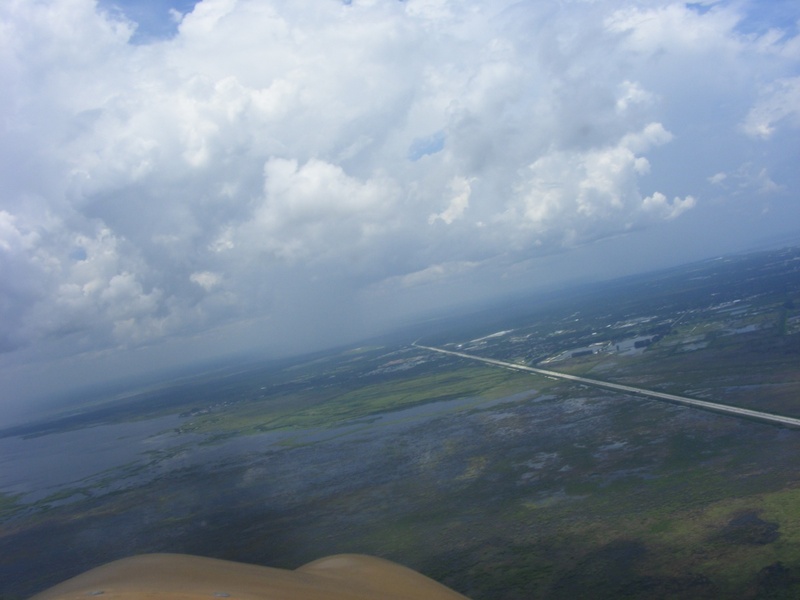 I continued the turn and found a rain shower over the Indian River lagoon up by Cocoa, Florida on US 1. 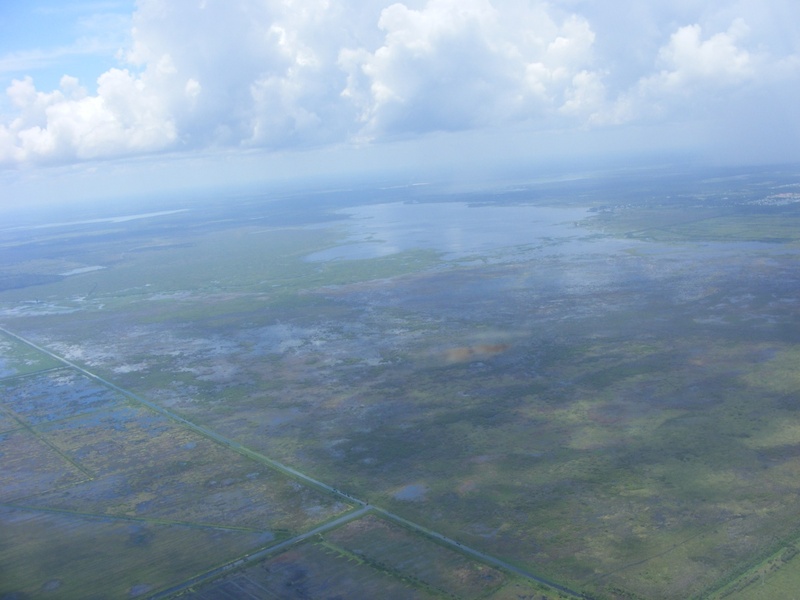 Here is the view looking South along I-95 toward Melbourne and Palm Bay completely hidden behind the rain. I had hoped to fly down that way again today, but that will not happen. 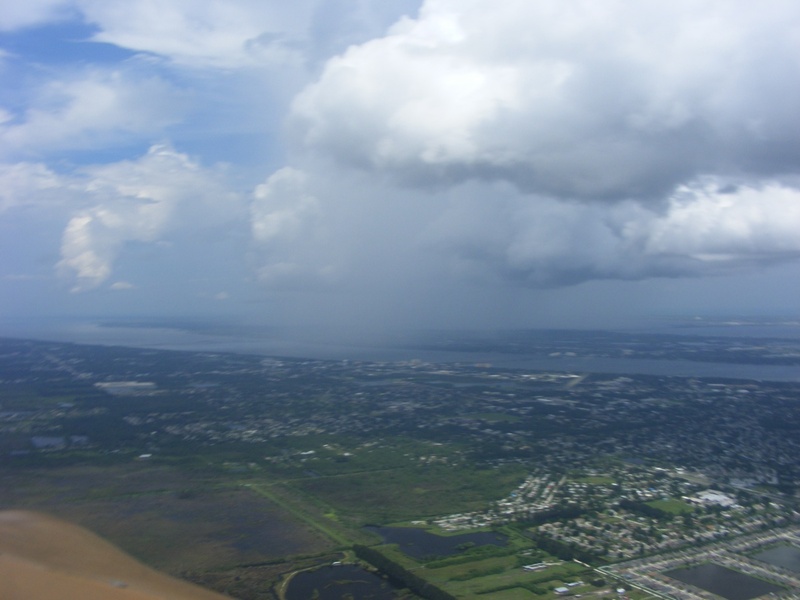 The rain extends to the barrier islands and the Atlantic Ocean. I am not going that way for sure. This photo is looking south showing the new exit under construction at Viera. 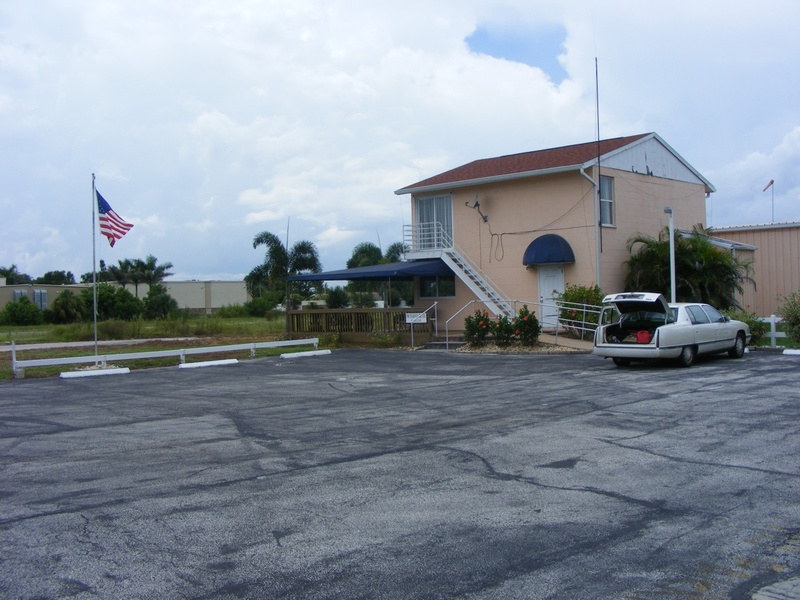 I continue my right turn back toward the Rockledge Airport knowing this is going to be a short flight. 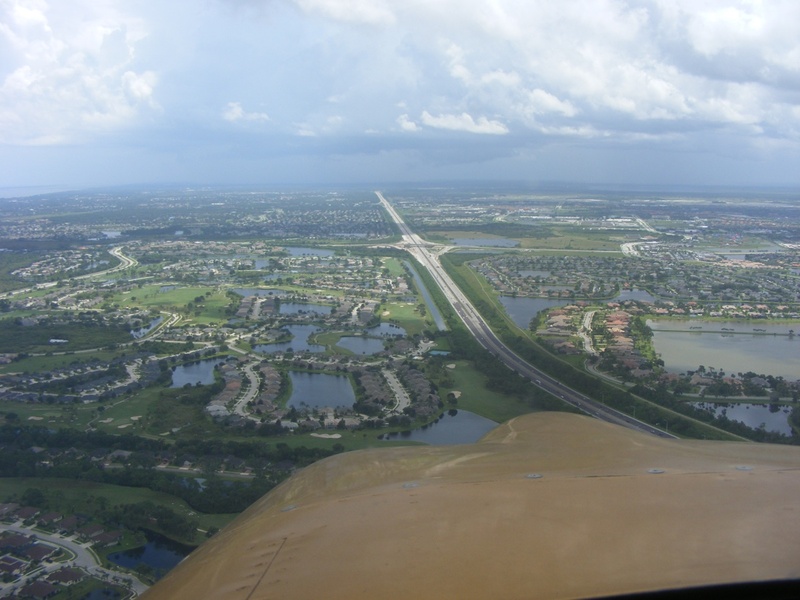 That exit from I-95 behind my right wing is exit number 195 to Fiske Boulevard and Barnes Boulevard which goes East to the Rockledge Airport and US 1. The airplane is pointing west as my camera is pointed north during my second turn that will set me up for the approach to Rockledge Airport. The GPS elevation was 2,662 feet MSL about the time I took this photo. The rain has soaked this part of the county looking northwest. 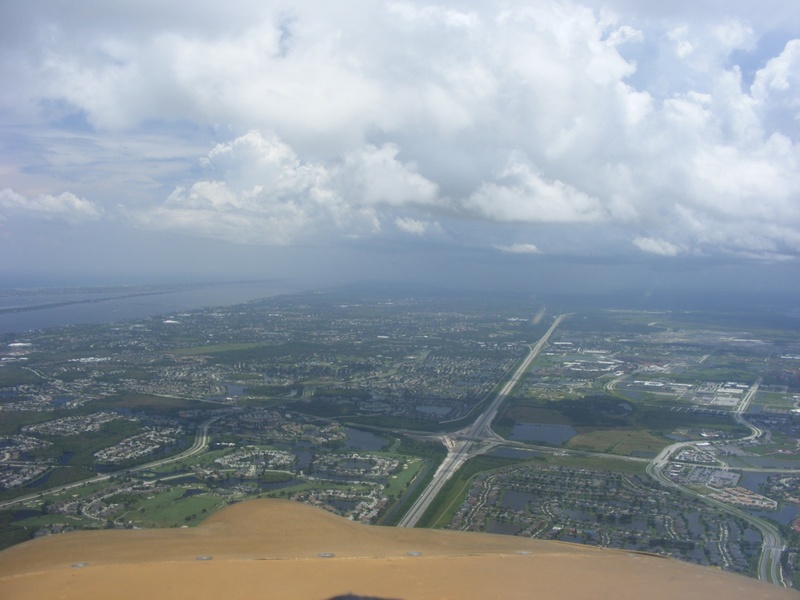 I am now southbound in the downwind leg for runway 36 near the Rockledge Airport. There is some sunshine getting down to ground level ahead in Viera, but my intended area of flight is still getting a rain shower with no visibility down south. 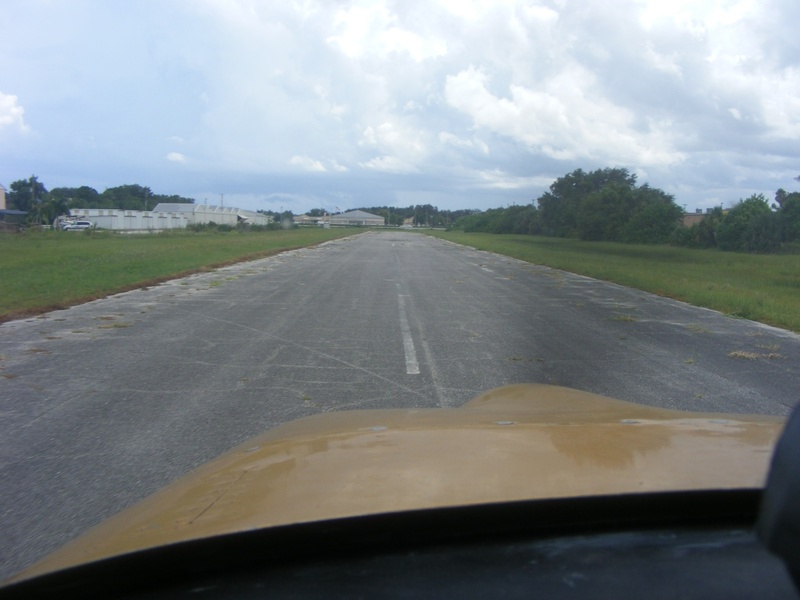 Down on the runway, I had time to take a photo looking south as I taxi back to the ramp. The rain showers to the south are clearly visible down to the horizon. I was able to taxi into the hangar before engine shut down. 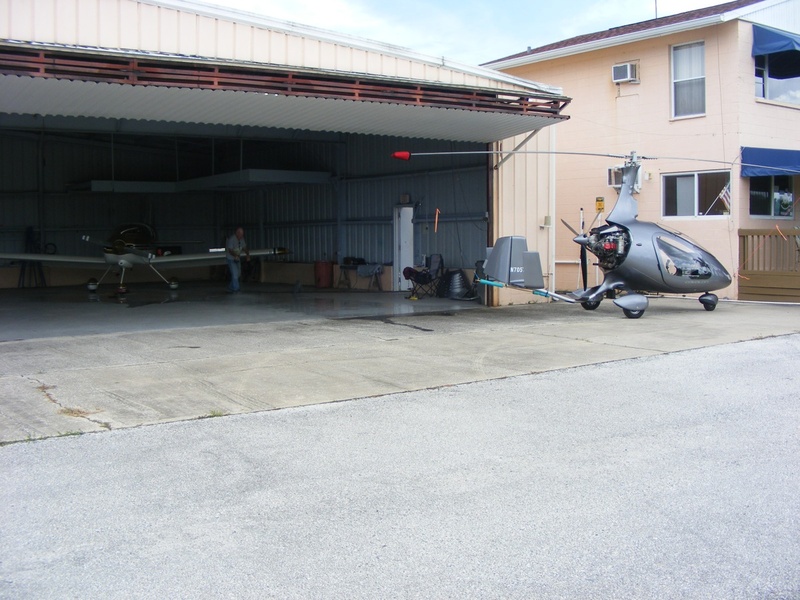 I used my red tow bar to push my airplane back to its normal location in the southeast corner of the hangar. It did not rain on me or the airport during the short flight. 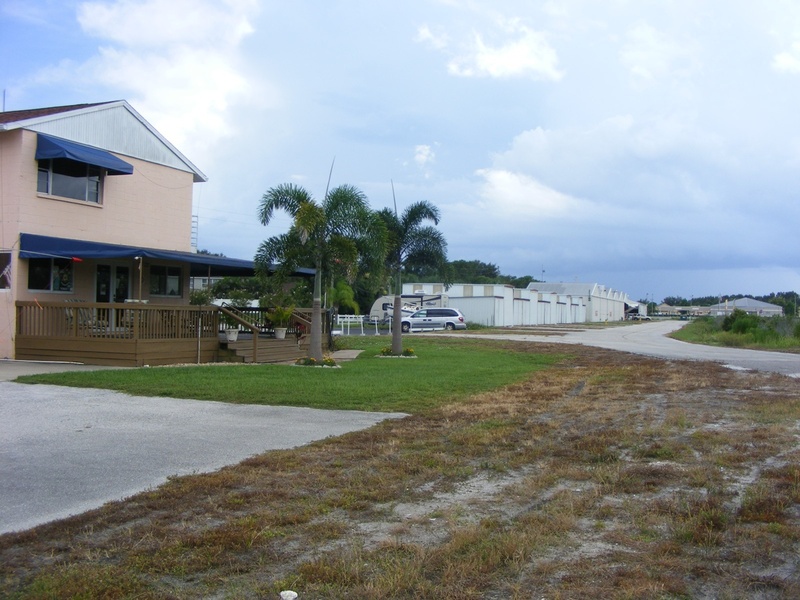 This image shows the OFFICE and the hangars down the taxiway and rain to the south. Bill has been working on the rotorcraft today as seen by the cowling off the engine. He is washing out the dirt previously blown into the hangar. I put my tool box back in the car along with my log book and GPS before heading home. The Hobbs meter added 0.3 hours. When I downloaded the GPS ground track, I discovered the file covered only 17 minutes 17 seconds, which includes the ground time. 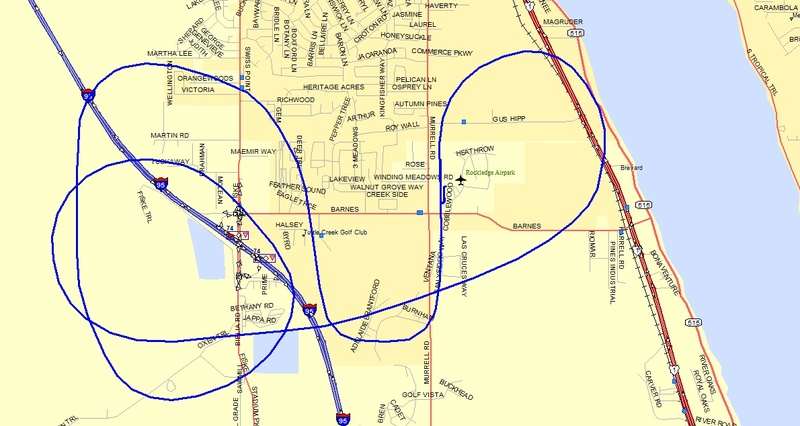 The GPS data points at takeoff and landing shows the time in the air at NINE minutes SEVEN seconds. The maximum GPS ground speed was recorded at 145 MPH. Here is the GPS ground track for what is SURELY the shortest flight I have ever made. (Don't call me Shirley.) 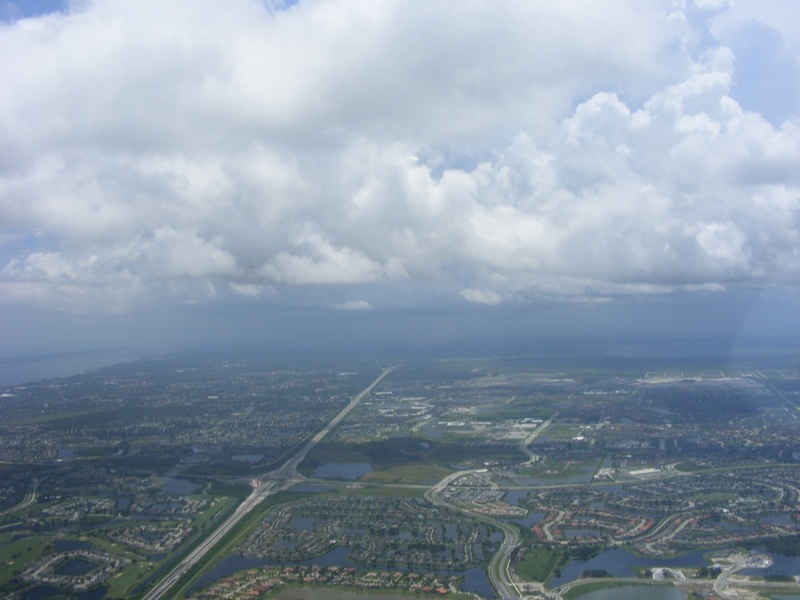 Regardless of the weather, the flight reminded me of one important thing when flying in Florida, take off early in the day to avoid the afternoon rain showers common in the summer months. 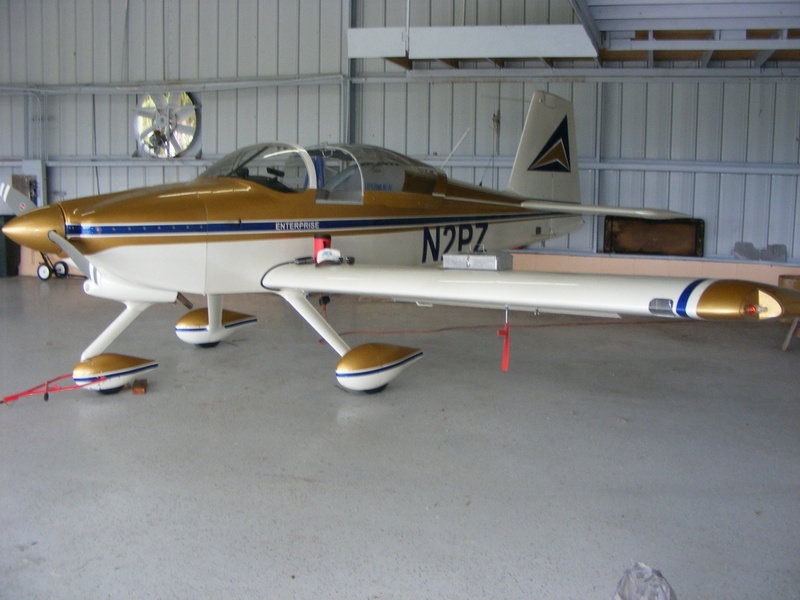 Publishing this web page on flying again confirms I am back home again after my two week road trip that began on July 6.